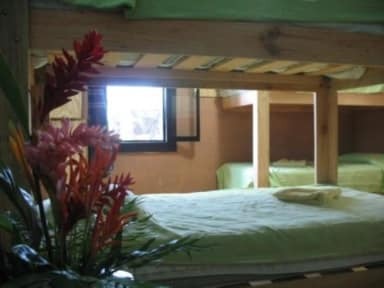 We are a hostel inmerse in a jungle atmosphere with open spaces and green areas, we count with all the commodities and services you need such as; air conditioner, Free internet,TV Movie lounge, hot water, hammocks, comunal kitchen, ping pong table. The hostel has 3 dorms with 8 beds and private bathroom each one. Every costumer will be provide with clean sheets, towels, soap, and personal locker. (all the rooms count with fan) and private Bathroom each one. 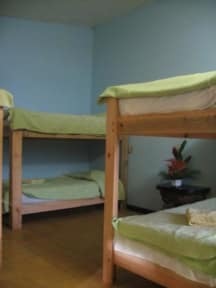 The hostel also count with two private rooms. We just open the 20th of dec. of 2008 come and meet us we promes you a great and friendly service. I stayed in a private room slightly offsite from the rest of the hostel, and my room was clean and great value for a private bathroom. There's no breakfast included and food does seem to be more expensive in this town. But overall, I enjoyed my stay here. I actually really liked this hostel. I liked the way the kitchen area was also the reception area. It was very nice as you walked in I was pleasantly surprised. The rooms and beds were clean. Ample and safe storage areas. Had a bit of a bad time with mosquitoes which you would expect in jungle area, nothing to do with the hostel just an advisory to bring repellent. Would recommend the hostel. Easy walk from the ADO bus stop and another easy walk into town. WiFi is only available in the reception area which is a definite downside as our room was across the street and around the corner. Same day laundry service was a good bonus, and there is a desktop computer in reception which is very handy. Breakfast isn't included and adjoining restaurant is expensive. Better to go down the road toward town for breakfast. The hostel design is quite fabulous. Security is excellent as there are working cameras everywhere. If this were my hostel, I would create events for guest that would give them an opportunity to get to know each other. I have stayed in hostels that did a great job of this and every guest extended their stay. One guest for 5 weeks. This area of Chiapas has so much to offer it would not be difficult to keep them busy and the tours packed. This hostel could be a great money maker. I arrived early in the morning from a night bus and then left that same day on a different night bus. There is a kitchen where you can cook; the dorm rooms were nice with comfy beds. There is a high pressure, hot shower & huge lockers for your stuff. They even have a Temazcal in the back garden. You can only get access to the internet in the reception area and it cost only 20 pesos for a collectivo to the Ruins which you can catch 2 blocks away from the hostel, so that was awesome! The hostel is really nice. Free water. Hot shower. Nice garden around. but the WiFi is s...t.
Nice hostel with a beautiful garden. Rooms are spacious and the beds are comfortable. Staff is ok but not more than that. Wifi is only working in the lobby. As there is not really a cozy place to hang out it's hard to get in touch with other people. With a bit more atmosphere it would be an awsome hostel! An eco lodge vibe... Bathrooms are outdoors. Pretty quiet hostel. you will feel the springs of the matress while sleeping, the internet supposed to be just in the lobby doesn't work so not so easy to plan the rest of the trip. they don't know which bed you use so you can come in after your day and there is no more bedings on your bed so you have to go back to reception and ask for new ones and do your bed once again... happened to me twice in 3 nights..